A letter from U.S. Secretary of War Henry L. Stimson to Edna P. Hancock dated May 25, 1945. In the letter, Sec. Stimson announces that Hancock's husband, Sergeant John B. Hancock (1913-1944), was posthumously awarded the Purple Heart from President Harry S. Truman. Photocopy of original 1-page typewritten letter from Henry L. Stimson to Edna P. Hancock, May 25, 1945: Private Collection of Linda Hughes. Digital reproduction of photocopied 1-page typewritten letter from Henry L. Stimson to Edna P. Hancock, May 25, 1945. Originally created by Henry L. Stimson. 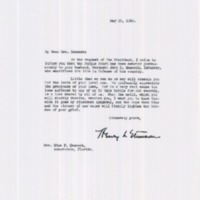 Stimson, Henry L.. “Letter from Henry L. Stimson to Edna P. Hancock (May 25, 1945).” RICHES of Central Florida accessed April 20, 2019, https://richesmi.cah.ucf.edu/omeka/items/show/9312.